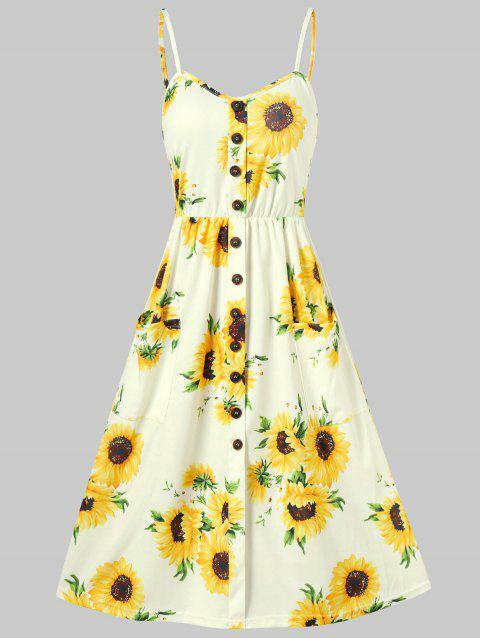 Enchanting garden sunflower blooms bring a fresh, summer-ready vibe to this spaghetti strap midi dress fashioned with slim shoulder straps and styled with a carefree button-down. Its large, opaque patch pockets add extra convenience to this bright sundress. Trendy A-line silhouette. Sleeveless cut. This dress is soo pretty. Deep vibrant color. So many ways to wear it. A great addition to my wardrobe. Good This dress is soo pretty. Deep vibrant color. So many ways to wear it. A great addition to my wardrobe. 1. Sign in the account through your registered email address on our website. 2. Add product to your Bag, and then choose the delivered country, shipping cost will appear. 3. Click "proceed to check out" button. You will find different shipping and payment options for you to select. 4. Enter in your account details and delivery address. Q:I’m confused on the length of this dress. Is it a mini or a midi dress? Q:Hi! I have one, quick question about the sizing chart, for this particular dress. I usually wear a size 12 in dresses, so, would I order a size 2XL, for this dress? Thanks!